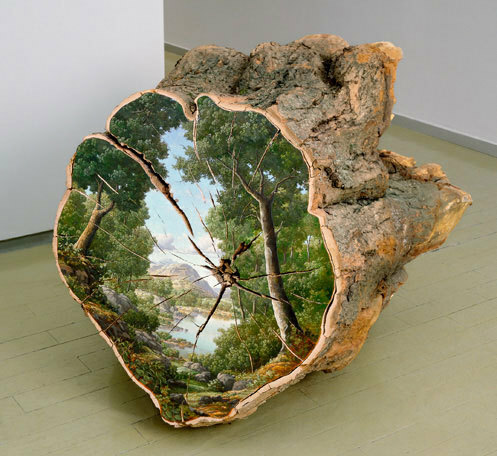 »phot»culturenlifestyle: Stunning Paintings on Fallen Tree Logs Portray Their Scenic Origin Artist Alison Moritsugu composes stunning paintings of mother nature’s scenic landscape on logs, which reflect the place of origin of each tree. The realistic and romantic portrayal of each image is beautifully juxtaposed with the rustic canvas. To maintain the integrity of her work, Moritsugu solely uses tree logs which have fallen naturally due to a violent storm or from others who cut them down and plan to chip them away. The artist also uses endangered species to add significance and an environmental conscious dialogue to the value of her work.